← Building “Peg”: Steely Dan On the Creation of Their Classic Aja. How Art Happens: Conversations with Frank Gehry Brightly Illuminates the Master’s Creative Process. That Toronto-born Frank Gehry is the world’s most famous living architect, many would argue, is without question. It is best demonstrated, they’d say, by the instant recognizability of his style. 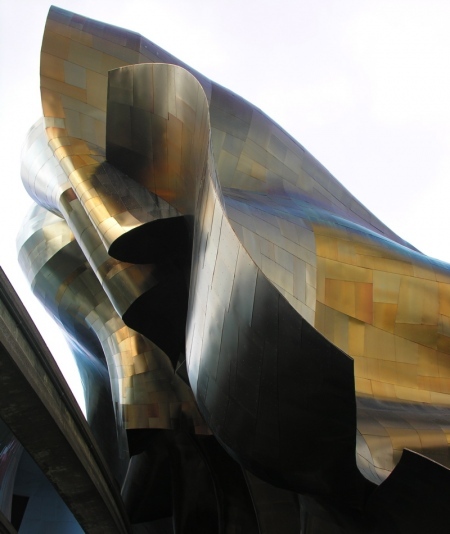 Anywhere one sees it passionately realized—for example, in the flamelike arcs of Seattle’s Experience Music Project, above—one knows that only a single person could be responsible for that building. 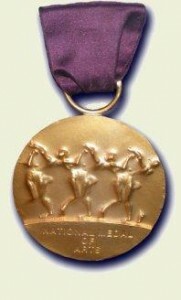 Others would urge that his having been awarded not only the Pritzker Prize—”architecture’s Nobel,” as it is often regarded—or the American Institute of Architects Gold Medal but also the U.S. Congress’s National Medal of Arts, above, puts him in a singular class. 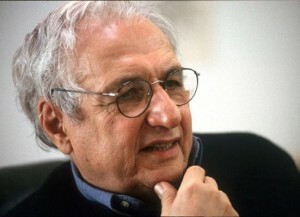 Still others would note that he and his work were examined in a film by an Academy Award-winning director: Sketches of Frank Gehry, by the late Sydney Pollack, one of his his last films and only documentary. 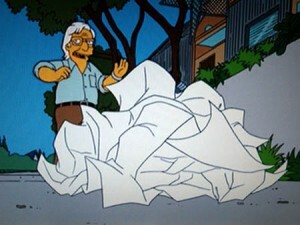 I’d say, however, there’s really only one truly objective proof of Gehry’s renown: He’s the only architect alive to be featured on The Simpsons. In a 2005 episode, right, he’s hired to design a concert hall so that Springfield’s citizens will appear more sophisticated to their neighboring Shelbyville. Of course, that it’s ultimately closed and turned into a prison isn’t the point. It’s that Gehry’s work has so much mindshare the Simpsons‘ writers felt him suitably big enough to both feature and lampoon on a mainstream animated series. An architect. That episode aired, however, right around the time that, in real life, Gehry, right, had begun a new project with L.A.-based cultural writer Barbara Isenberg. She’d interviewed him numerous times over a twenty-year period, and Gehry, then 75, had just approached her with, literally, a once-in-a-lifetime offer. “He asked me if I would help him organize his memories through an oral history,” the journalist, below, says on her web site. I was immediately drawn to the idea, having enjoyed our many earlier interviews, and what began as an oral history soon evolved into the conversations I’ve edited here. Since December 2004, Gehry and I have met regularly at his Los Angeles office and Santa Monica home, over restaurant breakfasts and conference room lunches. We’ve talked about the family he was born into and the families he created, who he wanted to be and who he became, what architects do generally and what he does specifically, always coming back to the family, cultural and geographic forces that have shaped his aesthetic. Barbara Isenberg talks about Conversations with Frank Gehry, the book she authored, based on those interviews, during my WBAI-NY / 99.5 FM radio show, NONFICTION, this afternoon, Friday, December 18, at 2 pm ET. You can hear her ideas—and Gehry’s—by tuning in at 2 pm. If you’re outside of the New York tri-state, check out our live stream on the web. If you miss the live show, dig into our archives for up to 90 days after broadcast. Thanks for the tag on the photo.